The Palace of the Uffizi was designed in 1559 and only took its architect, Giorgio Vasari, five years (1560-65) to build; this was the period in which Cosimo de' Medici, the first Grand Duke of Tuscany, was steadily consolidating - bureaucratically as well - his recent rise to power. In the shape of a horse-shoe, the Uffizi buildings stretch from Piazza Signoria to the River Arno and are connected to Palazzo Vecchio by a passageway above Via della Ninna and with the Pitti Palace by the Vasari Corridor (1565): they were designed to house the "offices" (from here it takes its name) of the thirteen judges who directed the the city administration. The rooms on the ground floor instead were designed as workshops and studios for the court artists and craftsmen specialized in working metals, precious stones, glass, ceramics and tapestries. The ancient Mint, where the florins were coined, was situated on the West side and incorporated into the Palace, together with the "Fonderia" (or Pharmacy), which specialized in the distillation of perfumes, medicines that were supposed to be miraculous, and poison. (Many of these activities were illustrated by Vasari's students in the paintings on the walls of Francesco I's "Studiolo" in Palazzo Vecchio). Alessandro Fei "The goldsmith's workshop"
Vasari knocked down all the houses in the quarter of the "Baldracca" quarter to make room for the new buildings but spared the church of San Pier Scheraggio and incorporated it into the construction; up until the construction of Palazzo Vecchio, this Romanesque basilica (consacrated in 1068) had been used for the City Councils of the Florentine Republic (Dante was a councillor here too). Restoration work on the church in 1971 led to the discovery of earlier remains and stratifications, including traces of a frescoed room dating from the Roman "Florentia" (perhaps a tavern) and a church of Longobard style. Today this area, which is situated beside the entrance to the museum and used for conferences, contains detached frescoes by Botticelli (Annunciation, 1481) and Andrea del Castagno (the series of Famous Men from Villa Carducci at Legnaia, 1450 ca.). 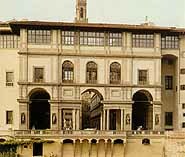 The design of the huge Uffizi building, which can be considered Vasari's finest masterpiece, is based on the contrast between the white plasterwork and grey local stone (taken from Brunelleschi's construction of the Hospital of the Innocents) and also strongly influenced by Michelangelo's design of the Laurentian Library (window frames in relief and strongly marked mouldings). The architecture of the building gains in slenderness and light thanks to the large number of decorative elements: from the ground-floor loggia with its columns and pilasters, the mezzanine floor with its small square windows placed between corbels, the first floor with its formal, large and balconied windows, to the parapet and columns of the upper loggia and lastly the great overhanging roof. A square (the square of the Uffizi) is created in the interior of the rectangle, which almost becomes a courtyard. When Vasari died (1574), he was substituted by architects Alfonso Parigi and Bernardo Buontalenti, who completed the building by 1580, joining it on the Western side to the Loggia dei Lanzi, where they created a hanging garden on the roof and a little loggia that was destroyed in 1840. In 1581 Francesco I ordered Buontalenti to close the upper loggia and transform it into a Gallery which was to contain the Grand Duke's collections of art. In this period we find painter Allessandro Allori's accounts registering his expenses for the elegant grotesque figures frescoed on the ceiling of the first corridor of the Gallery. Buontalenti also carried out the Tribune (1584) and the Medici Theatre (1586, demolished in 1889), where many famous performances were staged; in height this occupied what are today two floors of the Gallery of Prints and Drawings: three of the powerful wooden trusses that held up the ceiling were brought to light in 1978 and can be seen today in the Room of Botticelli. Some of the last changes were made by the Lorraine family in the 18th century with the new (and still up-to-date) East entrance and the addition of graceful staircases and vestibules, painted in red and pastel green, which were almost neoclassical in taste. Architect Gaspare Maria Paoletti carried out the splendid Room of Niobe in the West Corridor, worthy pendant of the Tribune, to contain the twelve classical statues from the Villa Medici in Rome. The 28 statues of famous Florentines that stand in the niches of the external portico, which goes all around the square, were not placed there until 1835.